Back to Back double header for 3 days in a row now. You tend to feel bored, You shouldn’t be, Because IPL just gave two of their best games on a Monday and that in a month end. Have to feel sorry for those who definitely missed it. Game 1, RCB looking to pluck their away game losing streak in Jaipur, but before that Dravid won the toss and decided to field first. As always Gayle gave a brisk start, but Middle order of RCB didn’t capitalise much on it. Kohli, Henriqures & ABD played a kind of slow innings compared to their standards. But Vinay Kumar’s three sixes in the last over kept RCB over the par score. 171/6 in 20 overs. Dravid & co started the chase, but this time it was another Master stroke from the Skipper, brought Sanju Samson, 18 years of age young lad first down. he showed class in pull, elegance in inside out’s and innovation in Dilscoop. Still he departed after a good Maiden IPL fifty, Watson and Binny with last stroke ensured Royals fortress remained unconquered and RCB will have their fourth away game losses in a row now. Game 2, Mumbai takes on KXIP, Gilly decided to sit and came in skipper David Hussey, Rohit sharma who won the coin decided to bat first, as he decided, it looked like his sole responsibility to get Mumbai to a decent score, which he did fantastically by scoring 79 runs of 39 balls. Other Mumbai players stayed to support him, which meant Mumbai made 174/3 in 20 overs. Chasing started wayward, as KXIP lost two of the good players cheaply, Hussey & Marsh who got it first game tried his best to up the antic, before big man from Caribbean again pull out a one hand blinder to send March on his way back. Stiller Miller & Praveen Kumar played their parts to get close as much possible, but in the end 27 runs from David Hussey in last over made difference. – Ajit Chandila’s first over went for 13 runs highest for him in this season. – Sreesanth & Ravi Rampaul bowled the 22nd & 23th Maiden of this season. – This is 17th time Sreesanth gone more than 15 runs in an over in his IPL career. – 0/38 by Ajit Chandila is the most expensive over in his IPL career. – Abhinav Mukund made his IPL debut, after playing with CSK for three years, now he gets his first game for RCB after getting picked last year. – Virat Kohli reached 2000 runs in his IPL career; he is the ninth batsmen to do so. – 22 runs conceded by James Faulkner in the last over, is the highest he has ever conceded in his T20 career. – 63 runs scored by Sanju Samson is his highest score in a T20 game, bettering his previous best 41*. – Sanju Samson became the youngest player to score a fifty in a IPL tournament, he is 18 year old. – David Hussey became the third batsmen to score 5000 runs in T 20, after Brad Hodge & Chris gayle. – David Hussey’s last over went for 27 runs which is highest for this season, Rohit Sharma was the tormentor. – 19th Fifty scored by Rohit Sharma equalled the highest no. of fifties scored in IPL with Gambhir. – Rohit Sharma became the third batsmen to hit 100 sixes in IPL career. – Kieron Pollard now has 50 IPL sixes to his name. – There was 2 sixes scored of Malinga today, Which is also the first occasion in this season he has conceded a six. – Now IPL has 500 fifties including the latest by David Miller. – 14 runs conceded by Harbhajan in his 4 over spell is the most economical in his IPL career. – Gayle scored the 1100th boundary for this season of IPL. – In today’s both the matches first innings had three sixes scored in the last over of their match, which propelled their team score over 170+. For RCB it was Vinay Kumar & MI it was their skipper & Birthday boy Rohit Sharma. Ironically one ended on a winning side and the other on the losing note. Prince of Kolkata returns to his home ground Eden Garden as the opposition skipper, Must Win situation, a lose here will put Pune Warriors out of contention for this year’s IPL. KKR on a winning roll, will like to continue the same without doubt. Gambhir won the toss and without any hesitation decided to bat first, and got off to one of the best starts for this season, When Gambhir departed to a well made fifty, KKR were 113/1 in 12.3 overs. McCullum followed skipper soon, Some tight bowling & brilliant fielding kept KKR under pressure and runs dried up totally. 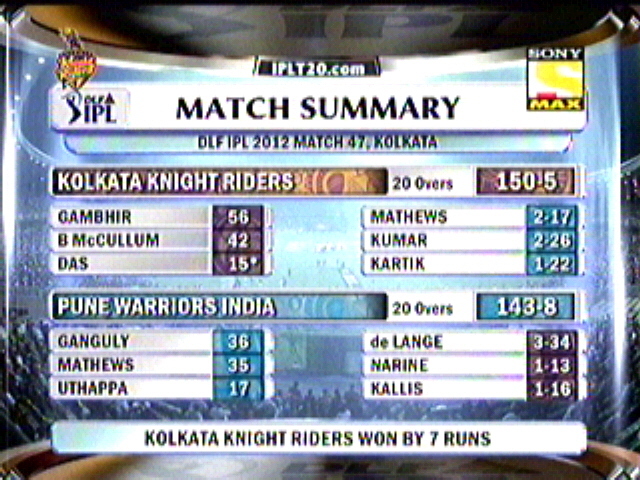 Eventually KKR finished with 150/5 in 20 overs. 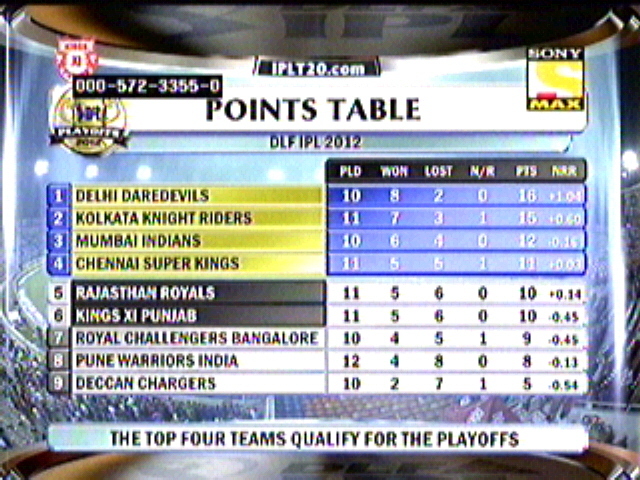 Dada would be very happy as they restricted KKR under the par score, for Pune, Mathews was the strike bowler. Clarke opened the innings with Uthappa, but even before both could get started Marchant de Lange who is playing his first game for this season picked up both the openers. For some reason Dada didn’t come to bat upfront and kept him at the back, may be he was avoiding to bat in front of his home crowd, but that was not the case as Pune Warriors fell like pack of cards, with score 55/5 in 8 overs and Ganguly had to walk in as the 7th Batsmen. To speak genuinely he was more than OK than the other games he played. He along with Mathews tried to bring back Pune into game and they almost did as well. Both brought the game so close as 24 needed from 16 balls one stage, but its the mystery off-spinner Sunil Narine again who has been main tormentor for Pune, as he picked 4-1-13-1. As the wickets fell at wrong time and Pune fell 7 runs short to victory. KKR won the match by 7 runs. Again a must win game for Royals, Dravid won the toss and decided to bat first, to note on front, they made five changes with respect to the last game. They dropped Shah & Hogg to get Shaun Tait & Botha back in squad. Rahane failed early today as he was gone for 5 runs. But Skipper continued where he left, scored another 46 runs along side with Watson’s 36, Menaria’s 34. Late strike from Hodge got Royals to 177/6 in 20 overs. Ryan Harris picked up 4 wickets, Thanks to Shaun marsh who plucked two impossible catches. KXIP started off in a wrong note as Mandeep fell in the second over, Saini as well didn’t stick too long, perished for Shaun Tait’s pace. Double strike came in the consecutive overs, for Royals were Hussey mistimed one to long on and Marsh next over missed a straight forward ball to hear sound of timber. Scorecard read 59/4 in 8 overs. From then on it was kind of ritual that KXIP has to play out, no excitement what so ever. Azhar tried few gimmicks for some time along with debutant Gurkreet Singh. 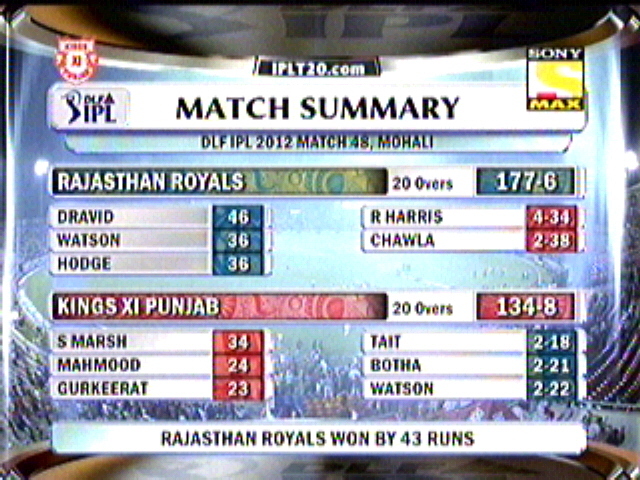 Nothing much though as KXIP folded out for 134/8 in 20 overs. – Sunil Narine & Shane Watson bowled the 16th & 17th Maidens of this season, both being wicket maidens. – 19 extras bowled by Pune Warriors equalled the highest no. of extras bowled in a match along with Kings XI Punjab & Royal Challengers Bangalore. – When Ganguly scored 6 runs, he went past to score 500 runs in Eden gardens. – With a loss against KKR, Now Pune Warriors India lost 5 games in a row. – Shane Watson scored 1000 runs in IPL and incidentally he is the quickest to achieve this feat. – Dravid has gone past 25 runs or more in his last 8 consecutive innings including this one. – 73 sixed conceded by Piyush CHawla is the most no. of sixes conceded by a bowler in IPL so far. – Gurukreet Singh made his IPL debut for KXIP. – Shaun Marsh on 11 went past 600 runs in Mohali ground. 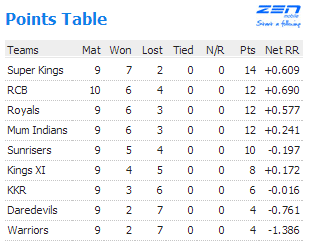 – Rajasthan Royals have never lost a game when they have scored 160+ runs, and the record continues to stay. – 44 runs scored in the last 9 overs by KKR is the lowest scored by KKR in the IPL history so far. – 8 catches dropped for the day is the highest ever for this season, Royals – 3, KXIP – 1 and Pune topped with 4. – Rahul Dravid scored the 50th boundary of this season. Finally, Its not a must win game for any of these two teams, KXIP will play for pride infront their home crowd for the one last time in season 3. Mumbai will look to book their semi’s berth and don’t want to take any chance in it. Sachin won the toss and decided to Bat first, in a very good batting track, Mumbai pulled in JP duminy to his first IPL game of this season, which made D.Bravo to sit out. KXIP almost had a renewed team, as new 5 made into squad, atleast it good they try out all now. (Good for next season) Mumbai got off to a bad start as S.Dhawan chopped one on to his stumps, Rayudu and Sachin continued in boundaries, runs came quick, Sanga needed desperate break thru gave the ball to Chawla, he responded with 3 big wickets, Which also include Sachin in it, Mumbai looked in a spot of bother at 74/4 in 10 overs, Sathish and Duminy played some quite overs,once Sathish departed, Pollard played a brief innings, To say, excellent bowling from KXIP which really surprised me, (without doubt many would have too, how come this team bowled so bad all this tournament..?) Duminy punched few shots to get Mumbai past 150 run mark and they ended with 154 in 20 overs, losing 9 wickets, 3 in last one. MI 154/9 in 20 overs. KXIP 158/4 in 19.2 overs. KXIP WON THE MATCH BY 6 WICKETS. – KXIP Bowled 5 MI batsmen, which is the highest ever in an IPL in a single Innings. – Race for no.of Boundaries is still on as Sachin tied today with Kallis with 61 each. – 3/24 by P.Chawla is the best bowling performance by any bowler for KXIP in this season. 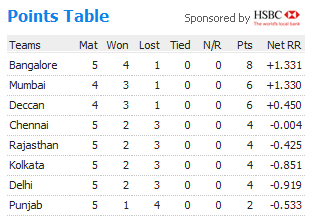 the most economical performance by any IPL team. – Malinga(13) went past Murali(12) to occupy third position in most wickets list. Orange Cap – J.Kallis (493) followed by Sachin Tendulkar (423) and Naman Ojha(352). Purple Cap – Pragyan Ojha(15) followed by Amit Mishra(14) and Malinga(13). Most Fours – J.Kallis (61) tied with Sachin Tendulkar (61). Both teams are the in the bottom of the table, and coming back after a win, who ever wins will climb up to 5th place of the table. So this game is certainly important for both the team. 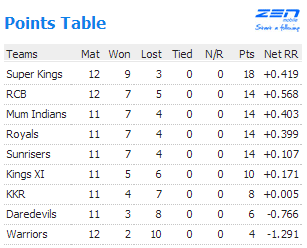 KXIP will like to drive on their home ground advantage, but ironically they have lost their previous home games. RR 183/5 in 20 overs. KXIP 152/10 in 19.1 overs. RR WON THE MATCH BY 31 RUNS. Adam Voges won the Man of the Match for his innings which ensured 2 points for RR. – 76 runs scored by KXIP in the first six is the best ever scored by KXIP in IPL. and so far the best for this season. 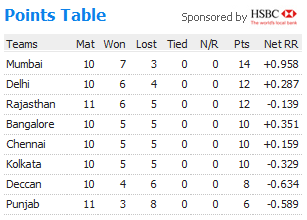 – Bopara (197) overtook Shewag (186) and back to second spot for race of Orange Cap. – Yusuf Pathan scored just one six, but it takes him to share the honor for most no.of six scored along with Mathew Hayden and Robin Uthappa all scoring 11 sixes. – Until now only 3 Maidens have been bowled, 2 by Chaminda Vaas and 1 by Albie Morkel. – 3/22 is the best bowling performance by Shaun Tait in IPL. Orange Cap – J.Kallis (283) followed by Ravindra Bopara (197) and Virender Shewag (186).